An AutoData forms processing system from Southampton-based Kendata Peripherals is helping Derbyshire County Council to carry out a variety of traffic monitoring and car park surveys as quickly and cost-effectively as possible. 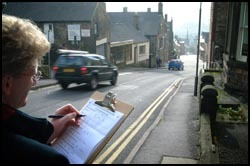 The councils environmental services department regularly undertakes surveys to monitor travel patterns of workers in the county, and these surveys generate an enormous amount of data - all of which needs to be entered into a computer for analysis. "Without some form of automated data entry, this work would certainly be more time-consuming and costly," said Neill Bennett, senior technician, data. "The data from each form would have to be keyed in manually, which would not only be laborious but also much more prone to inaccuracies." Originally purchased by the council for entering data relating to its ongoing concessionary bus fares scheme, the forms processing system has recently been upgraded to the latest version - known as AutoData Scannable Office - and is now used for a variety of different surveys, including the monitoring of traffic flows through so-called 'rat runs' and the use of public car parks. "These tend to be one-off projects or surveys that we carry out at the same time each year to see if any trends are emerging," said Bennett. "One way or another, the system is used on most days, and we probably scan in a total of about 15,000 forms per year." 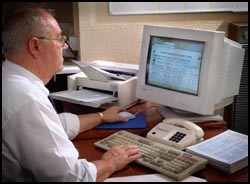 Comprising a high-speed scanner, forms processing software, Microsoft Word templates and special TrueType fonts, AutoData Scannable Office enables data to be scanned from the paper forms directly into an Excel spreadsheet or Access database without the need for cumbersome data exporting procedures. "The user front end is easy to get your head around," commented Bennett, "with options such as yes/no responses, alphanumeric boxes and pre-formatted date fields all being selected from drop-down menus." The environmental services department typically uses a combination of check-mark boxes and hand-print recognition fields in its form designs. When completed forms are returned, the AutoData system scans, processes and verifies all scannable objects on a form and then places the data directly into Excel or Access. "Any indecipherable hand-print characters are immediately presented on screen for interactive user verification," continued Bennett, "but Scannable Office has been designed to learn new character shapes and different hand-print styles so that, over time, recognition accuracy continually improves and the need for manual verification decreases." As well as saving an enormous amount of time for staff in the environmental services department, the AutoData forms processing system has given Derbyshire County Council the facility to carry out a wide range of surveys quickly, accurately and cost-effectively.